Does anyne know what can be done to reduce apex lifting around the loading plug hole? both rotor housings show same pattern. also the sideseals show quite a bit of wear after just 45min of running. I made the clearances all perfect at 0.04-0.05mm now they around all in the range of 0.15-0.2mm..?? Read this thread. This is the secret for stopping the spark plug boss lifting. It will make apex seals last longer too. These are the first PP housings I will make so any info is welcome! after fixing the plug hole and putting the engine back in the car it still smoked alot and didnt seem to clear up.. pulled the engine the night before the race once more.. the guys that balanced the rotors seemed to onlyhave a 8mm drill bit left, and little logic sense..
they only had to lighten the rotor 12g per side to match the weight of the other, which only 4g per tip... when I inspected the rotor before installation I wondered that it was so deep but it was closed.. found the piece luckily in the oilpan and not between rotor and side housing.. 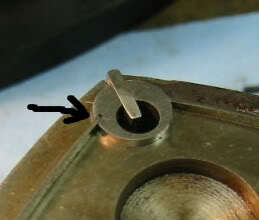 Looking at the smoking problem... does that balancing hole shown in this picture go through the rotor? Jep.. The small piece of metal left that made the hole appear not through fell off inside the rotor and was afterwards found in the sump. 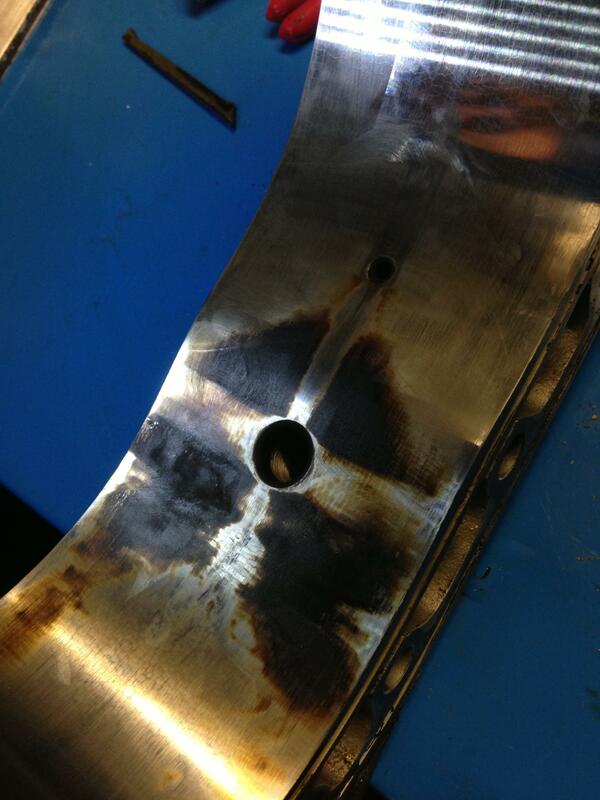 We soldered the hole with silver afterwards and now its fine again for the last 2 races! I do not really think that was the issue here. I was running MFR housings and as you can see they already have a huge mount of space for the water to flow and a very thin wall thicknes at the combustion side of the housing. I do altough agree that on stock housings this could be a good fix! the RX4 housings I am now making will also get the mods descirbed in the topic to try to get as much heat out there as possible. 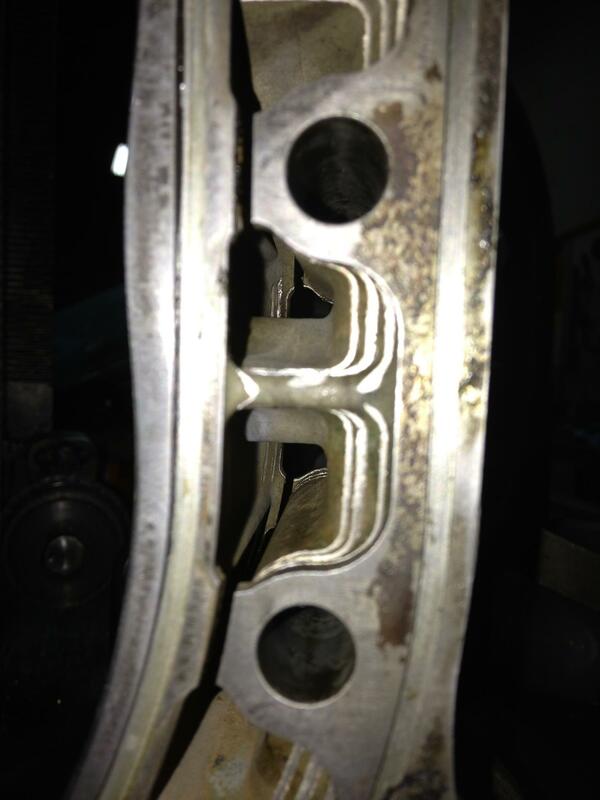 On the last pic you can see the crack at the spark plug boss. Rub, you have the MFR housings that I am trying to mimic when porting the REW housings! That is everything but the floating spark plug bosses.... that might not compliment boosted engines well. That crack might be too close the housing surface to seal but I applied 620 Loctite at every plug change.... it worked on mine for 50k miles. That crack might be too close the housing surface to seal but I made 620 Loctite work on mine for 50k miles. (every plug change). Yeah the reason for the crack is that the wall became extremely thin there after tapping M18x1.5 in there to fit the bushing for the threads that where missing. it altough lasted for 3 races. 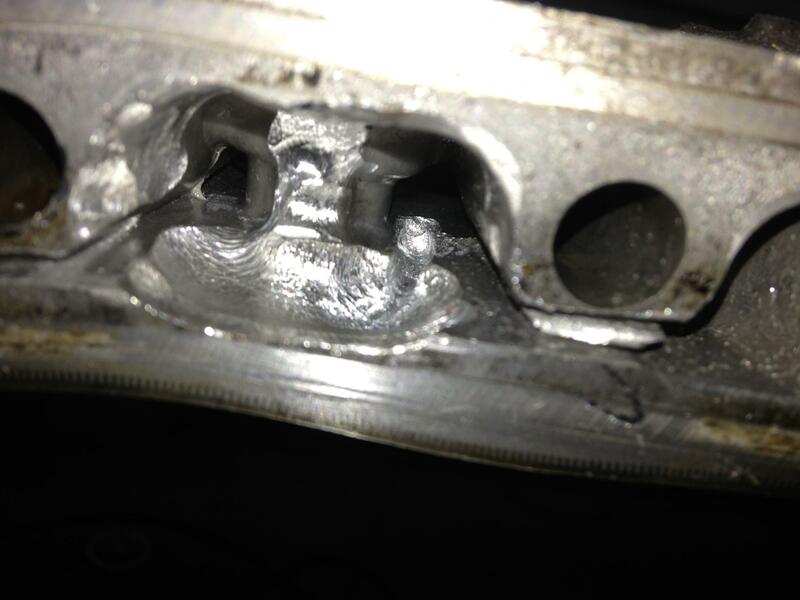 Now even with this porting I saw alot of seal lifting from the protuded leading spark plug hole lip. not really sure why it came. apex are fine and springs are good. Also Rub when you run the thermostat in the engine the water pump pushes against the thermostat's restriction and causes the internal pressure of the engine to be over 40 psi. This can raise the boiling point 60°F. The hottest point in the water cooling system is right at the leading plug spark plug boss. The trailing plug boss is second hottest. The first signs of boiling take place at these two points and caused the plugs to overheat and the spark plug boss to expand. The Pressure may be 16 PSI at the radiator cap and that will be with the radiator sees but the engine itself will really benefit from the higher pressures. This may also help some of your spark plug issues. While that is true, it will on the other hand decrease the water flow significantely. We see without thermostat about 70degC at engine water outlet to radiator. Do you think the problem is local boiling of the cooling water or lack of surface area and therefore too much deltaT between the surface and the water? "As the boiling surface is heated above a critical temperature, a film of vapor forms on the surface. Since this vapor film is much less capable of carrying heat away from the surface, the temperature rises very rapidly beyond this point into the transition boiling regime." The rest of the engine is running cooler but at the expense of the most critical point (spark plug boss) being overheated. 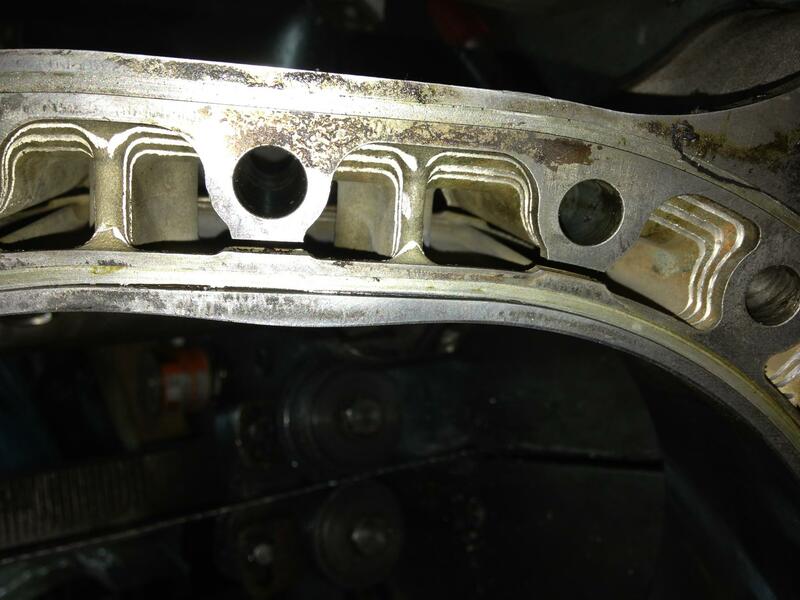 You can easily check for cavitation by connecting a gauge to the upper port on the rear plate. The gauge will oscillate when cavitation begins. About 7000 rpm for me. 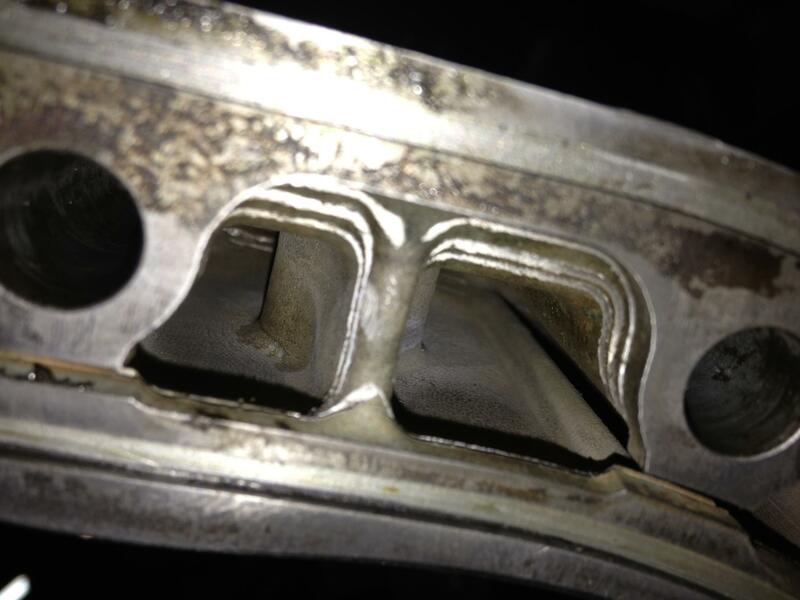 I would say because you have both lifting of the rotor housing surface at the leading spark plug boss AND noticeably increased sideseal wear your problem is not simply localized overheating at the spark plugs. Rather it would seem to me you have overall overheating of both oil and coolant AND/OR excessive exhaust gas temperature/backpressure. Since gross overheating of oil and coolant would not escape your notice I would bet on excessive EGTs and/or backpressure. Common causes- running too lean under load and detonation. On the side-seal wear. What clearance are you running? I have seen that type wear from using clearances less than .003" . When the side seal expands from high heat you will loose the clearance. 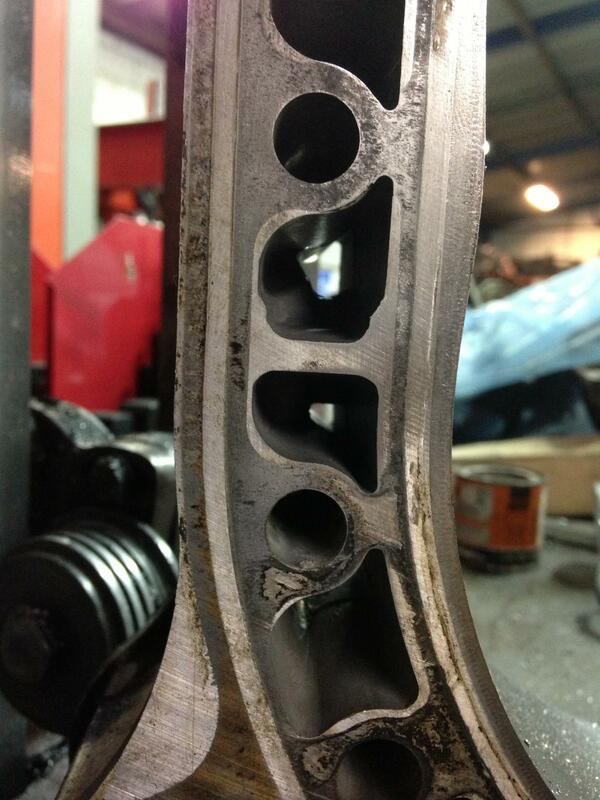 This can break the corner seal and/or cause high wear on the side plate. In the beginning we ran indeed way to lean because we a lot of troubles with the float emptying. in the same race we also had problem with the oil starvation in RH corners. after the race we opened the engine to see if there was damage to the bearing by running over 8000 rpm with under .5 bar of oilpressure. luckily all was still fine (good oil, DLC coating and balancing saved the day I guess). So the engine had ran slightly over an hour and there was already very minor wear in the freshly lapped and nitrided sideplates and the side seal also showed some wear. now after that the engine raced 2 races with 10 bar oilpressure and now there is no more extra wear on the housings and on the sideseals. so i think the increased wear observed was due to the moment without oil pressure where the rotor probaly will have wobbled on the journal causing the increased wear on the housings and sideseals. the inital side seal clearance was around 0.055mm. the corner seals had been DLC coated and even now there is no wear at all to the cylindrical surface where the sideseal touches it. I have now also thermocouples in the header so when the engine is back together I will be able to keep an eyeon EGT's. Cavitation should be under control as the pump is 56% underdriven but its a good tip and I will check it when the engine is back together. 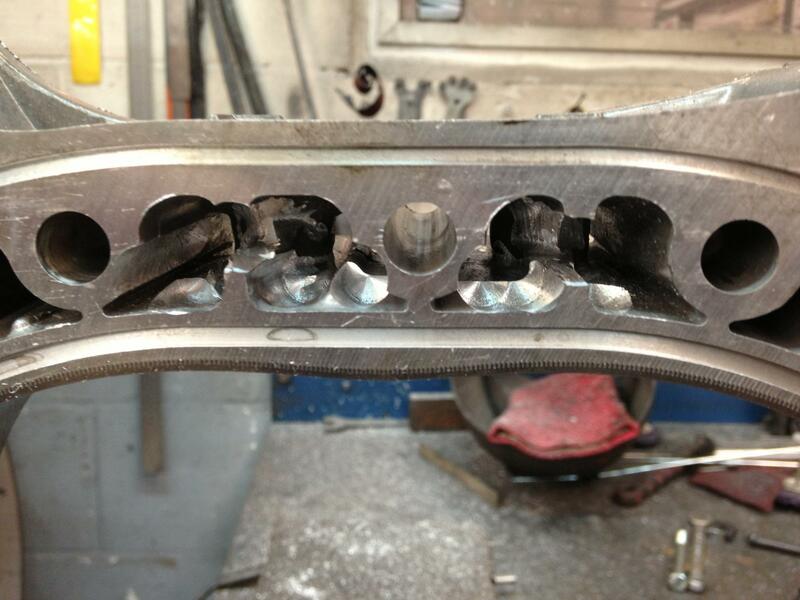 Your idea of some aluminum deflectors to focus the flow on the spark plug boss is a good one. But you should set up a test fixture to see with the flow looks like. This is what I did using city water pressure of 40 psi. We need more flow at passage five and less flow at passage six. 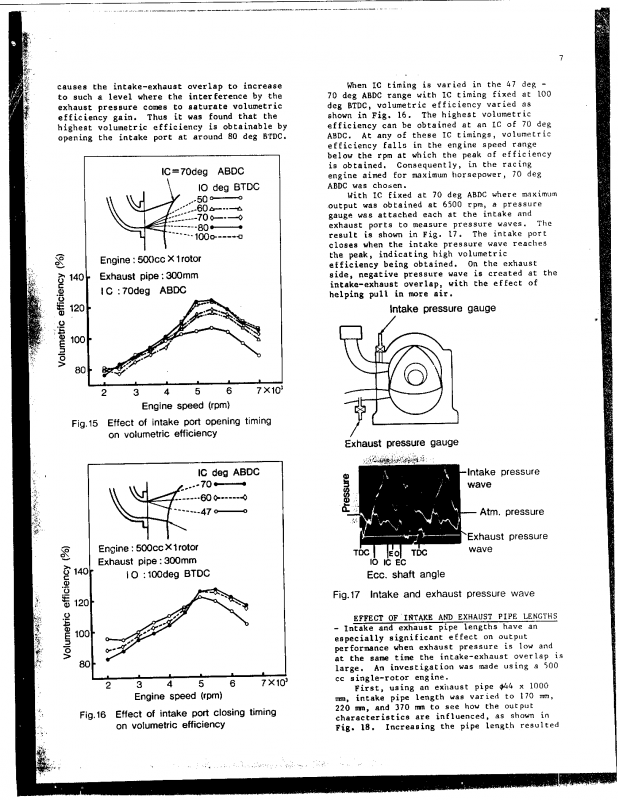 "Toyo Kogyo's Research and Development on Major Rotary Engine Problems"
pages 221 and 222. (If you don't have it I can send it to you). Their tests show that thermo shock was cracking the housings at the plug opening to the housing (axially). 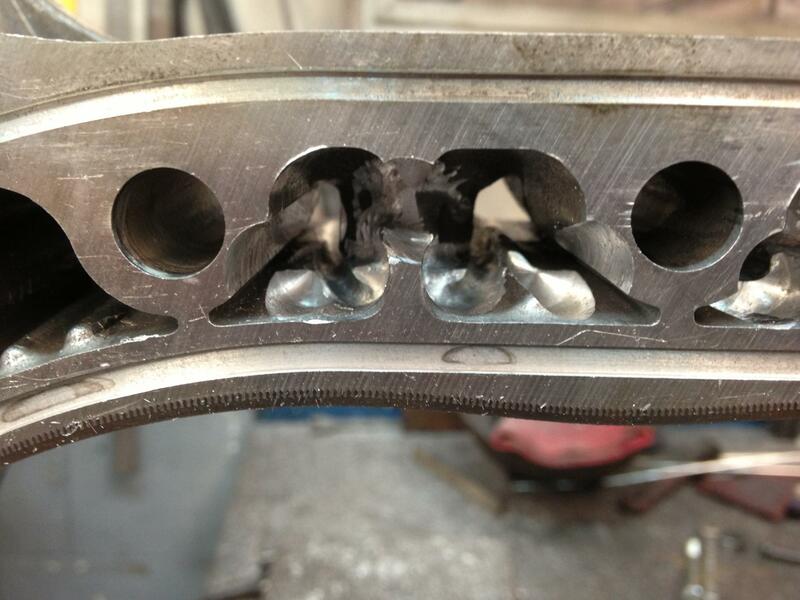 They decided to cut the housings bosses at the thru-bolts and allow the housing to float on the plug bosses. It also shows that without a thermostat the engine gets just as hot but heats up more slowly.... that is the engine can be allowed to be run hard without being fully up to temperature. We have to remember heat is good. It is what makes horsepower. We only want/have to cool at locations that have reached their material/physical temp limit. On the picture of the spark plug boss that you look like you were cutting out..... I have a question. Are you thinking about cutting it out and threading the end and then putting it in your manufacturers housing as a repair? Maybe you could add a heat sink also. that would a a solution but the wall on the MFR housings is really thin as comapred to a production hosuing. without measuring I would say about 1/3rd only. I did some more readong about the boiling at the hottest point in the coolant jacket around the leading spark plug. 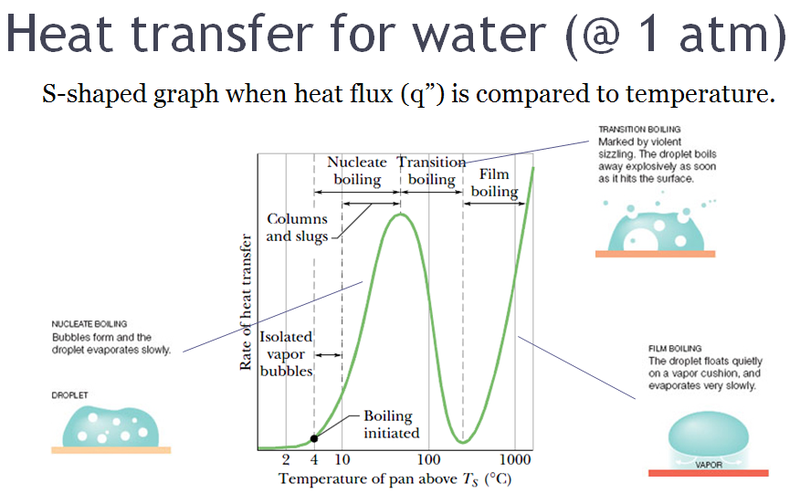 In belows graph we can see that boiling actually helps heat transfer a lot. but only up to a point called the critical heat flux. which around 30degC above the saturated temperature. Now when you increase the pressure in the collant. this cusrve will shift to the right and thus worsen the cooling effect as long as you would not be above the critical heat flux temperaure. So in case you are with stock pressure on the left side of this point. increasing the coolant pressure will have an adverse effect. in case you are at the right side. it will help you. now if I only had more time I could add a couple of 1mm thermocouples around the spark plug boss to see what actual temps are like. If the heat flux of a boiling system is higher than the critical heat flux (CHF) of the system, the bulk fluid may boil, or in some cases, regions of the bulk fluid may boil where the fluid travels in small channels. Thus large bubbles form, sometimes blocking the passage of the fluid. 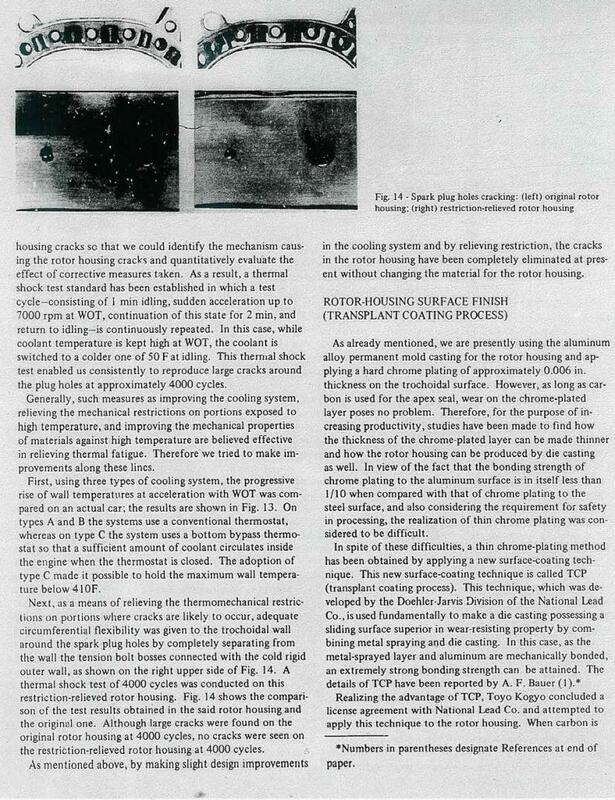 This results in a departure from nucleate boiling (DNB) in which steam bubbles no longer break away from the solid surface of the channel, bubbles dominate the channel or surface, and the heat flux dramatically decreases. Vapor essentially insulates the bulk liquid from the hot surface. 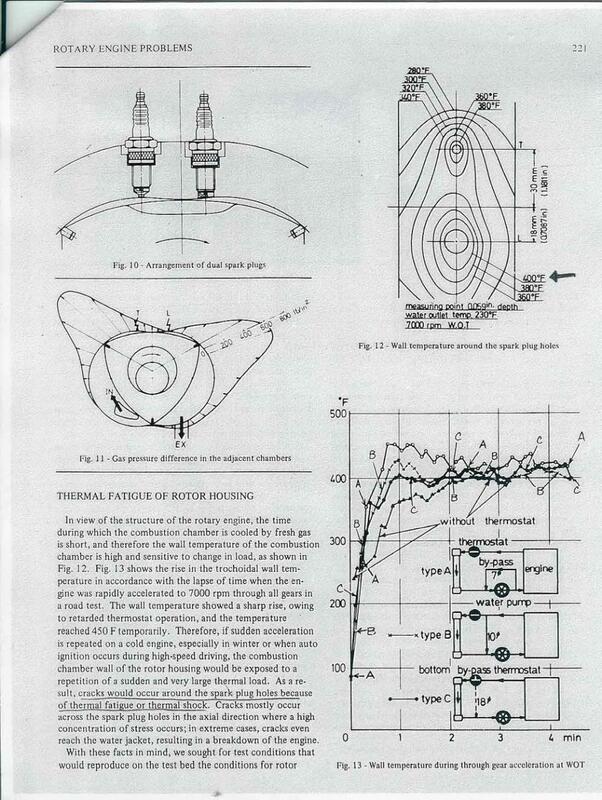 During DNB, the surface temperature must therefore increase substantially above the bulk fluid temperature in order to maintain a high heat flux. Avoiding the CHF is an engineering problem in heat transfer applications, such as nuclear reactors, where fuel plates must not be allowed to overheat. DNB may be avoided in practice by increasing the pressure of the fluid, increasing its flow rate, or by utilizing a lower temperature bulk fluid which has a higher CHF. If the bulk fluid temperature is too low or the pressure of the fluid is too high, nucleate boiling is however not possible." So for the "Clift Notes" we would like streams and bubbles but not a full vapor to develop. 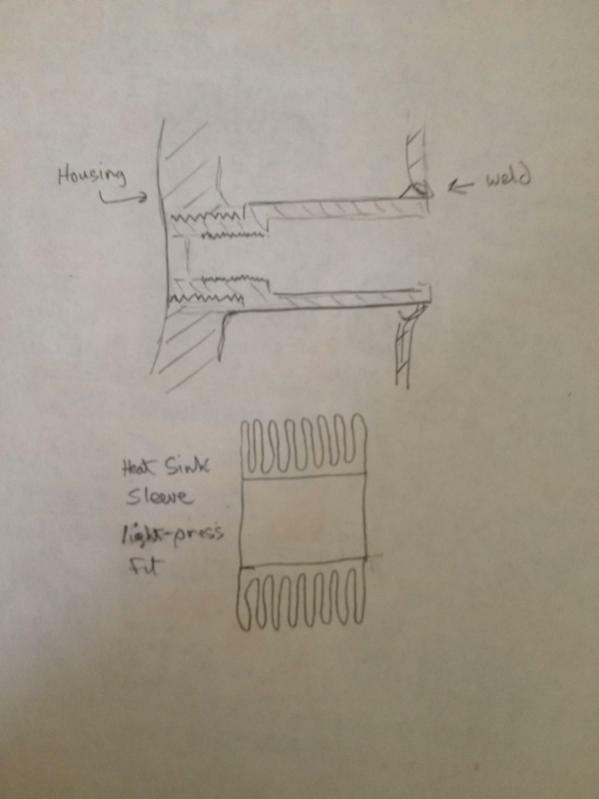 Your thermocouple idea would be great for a test but how much time do you want to put into it? Your tear-down evidence indicates extreme overheating of the spark-plug boss. 1 - higher pressure.... add a thermostat for back pressure (or an orifice if you are afraid of thermostat failure). 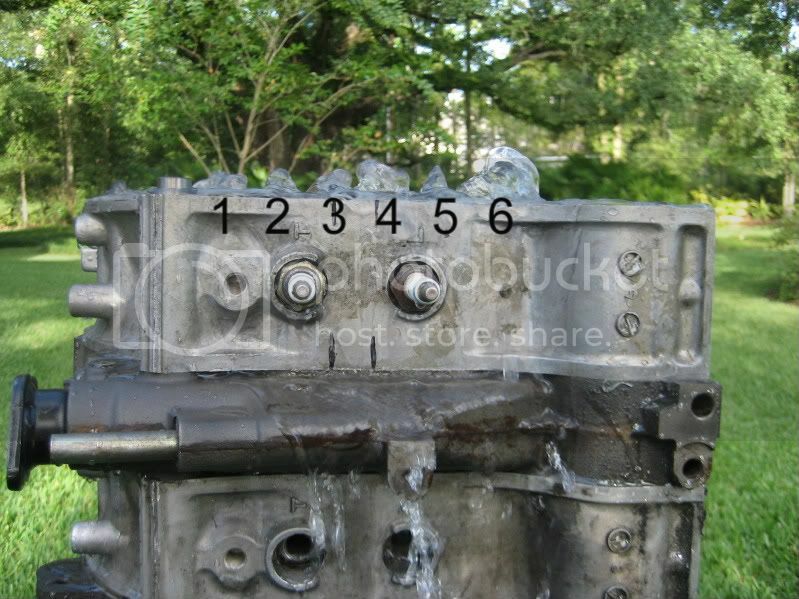 2 - add flow directly at the spark plug boss. 3 - change to higher boiling point coolant type. Rub, I had trouble opening the image...... So I thought I would republish for others. It is a very good illustration! And yes if we can keep it in the range of Nucleate Boiling it would be ideal. 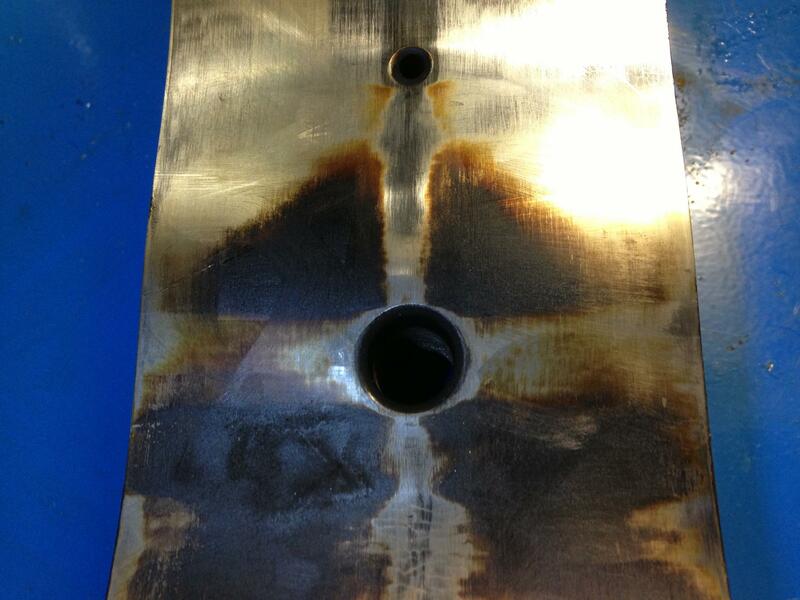 Using a coolant with a higher boiling point would negate this rate of heat transfer advantage. We will start now with running water instead of coolant and measure the pressure in the engine to make sure there is no cavitation. I ported the water passages in the housings, now its time for the in and ex ports. What would be a good exh port timing, the mfr housings had really late port opening, a lot later than the stock rx4, and fc and fd turbo housings, closing was really late so there is a hige amount of overlap.. This wouldn't help that much for racing...... but for a street peripheral this is what would work great. Plus as an improvement for the secondary port.... imagine a motorcycle powervalve moving.... inverted, right next to the housing/rotor interface ..... with very little space for reversion. Good info but seems to be 10A material. 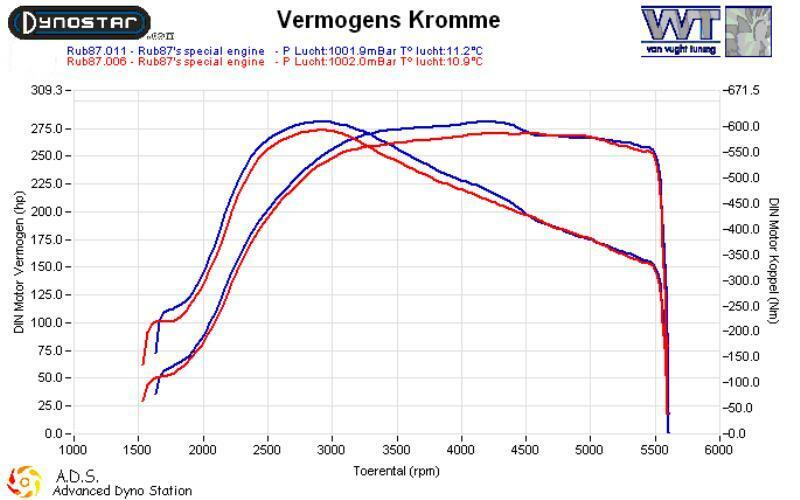 strangly they seem to have peak torque at around 5k5-6K no matter the port timing (could be because of the fixed length intake used for this test. do you perhaps have the next page also where they talk about intake length? the exh port opening matches with 12A mfr specs, but we seem to have quite some more overlap. intake opening is also very early but closing is in the ballpart of 80 deg ABDC. 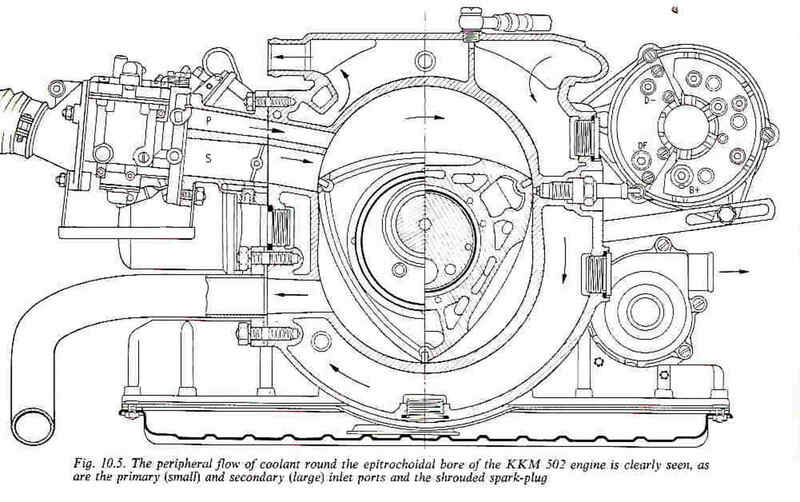 which close to the IC timing mazda came up with for the later MFR engines. so the only degree of freedom I have is to choose the overlap. and also the exhaust opening timing but these seem to be for most factory apllications in the 73-75 deg mark. some photos of the water jacket.